BlackBerry Bold 9650 Arriving On Sprint May 16th? Sure seems that way according to the picture that was sent into us via the tips line. The above pic is from the Sprint hotsheet, which was updated at some point this morning. 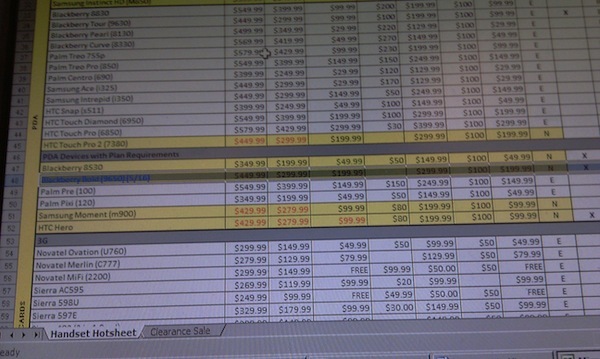 Looking at the list you can see the BlackBerry Bold 9650 listed along with what may be the pricing details for launch. Seems a lot of conversation surrounding the BlackBerry Bold 9650 is more Verizon associated rather than Sprint associated but judging by this, it looks like Sprint may be the first out the gates with it. Of course, when it comes to the BlackBerry Bold 9650 I've learnt to take all information with a grain of salt considering the amount of time we've already been waiting for this device.